CONQUER your goals. CONQUER your body. CONQUER your life. Currently held on Monday's (6-6:45pm), Wednesday's (6:15-7pm) and Thursdays (6:15-7pm)at Liphook Junior School. These are group based sessions, that bring people together socially, as well as offering a fun way to get fit and active. The sessions are open to anyone, regardless of ability! The current price for each session is £7 per person or a block of 5 sessions for £30. 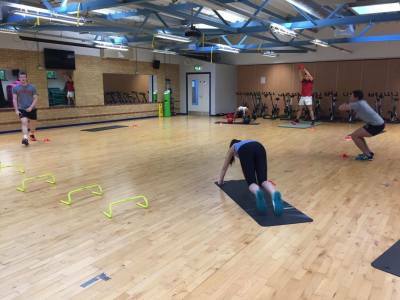 Following a short questionnaire, I will use your responses to produce an 8-week home/gym based training programme, that is tailored to your goals and exercise experience. This programme explains the exercises that should be performed during each given session during the week (incl. amount of repetitions and sets), as well as the teaching points to ensure that the exercise is performed safely and correctly. When purchasing this, you will also receive a basic training and nutritional advice sheet that is specific to you, which includes an estimation of basal metabolic rate (BMR) and protein intake. At the end of the 8-week programme, I recommend purchasing a new one with different exercises/intensities to prevent you from plateauing (shock the body to keep progressing). I offer personal training on a 1-1, 2-1 or 3-1 basis. This can be based at your home or at a local park, thus ensuring the service is as easy and comfortable for you as possible. These sessions are specifically tailored to your needs, goals and preferences.